I’ve had the good fortune to have many of my novels on state young reader’s choice lists. For me these lists and awards carry more weight than honors chosen by a committee of adults, because the winners are actually picked by the people I’m writing for. Not only this, but I think these lists create readers, not just for me, but for other writers as well. And creating lifelong readers is what writing is all about…right? Several years ago I spent a couple weeks in Elko visiting schools. While I was there I decided to place my novel “Zach’s Lie” in the town. It seemed like the perfect place for a family in the Witness Security Program to start a new life. During the day I spoke at schools. At night I did research for Zach’s Lie, which consisted mostly of walking around the city and eating in every Basque restaurant I could find. Their food is absolutely fabulous and the Basques turned out to play an important role in the book. Zach’s Lie won the NYRA in the YA category a few years back. 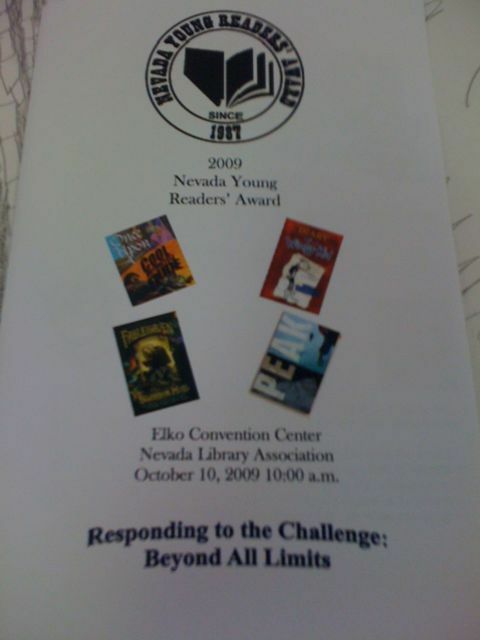 Today I’m being honored for a novel that takes place oceans and mountains away from Elko. Marie met me last night in Salt Lake City, rented a car, and drove me south. We got here about 1AM, stumbled into our room, and fell into bed for a few hours sleep. The drive was certainly worth it. Great fun seeing old friends. Before the award breakfast I spoke on a two-man author panel with Kevin O’Malley who won an NYRA for his book “Once Upon a Cool Motorcycle Dude”. I hadn’t met Keven before. He’s halarious and a cool dude…it’s clear why his books are popular with younger readers. 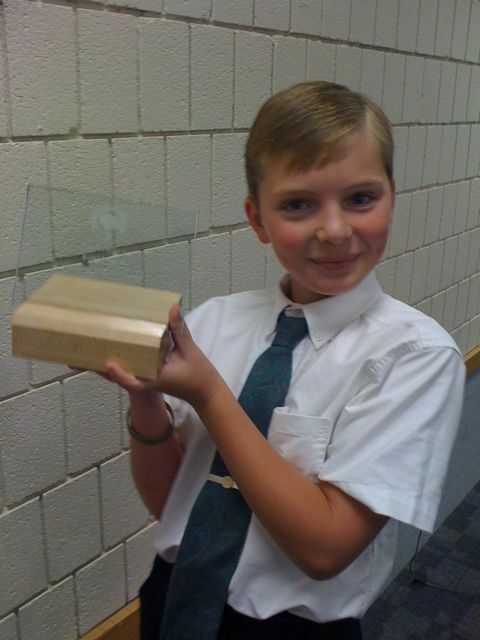 Ian Nisbet (below) from Flag View Intermediate in Elko presented me with the award. Thanks Ian! And thanks to Robbie Nickel and the other members of the NYRA committee for a wonderful morning in Elko. Ian and I really enjoyed meeting you! Thanks for taking time to come to Elko to receive your award! Hope we will cross paths again sometime in the future!